Asian governments are moving at a glacial pace to halt tobacco industry interference and implement WHO FCTC Article 5.3 (Figure 1). While some countries have made progress in reducing the interference, others have remained stagnant or regressed. 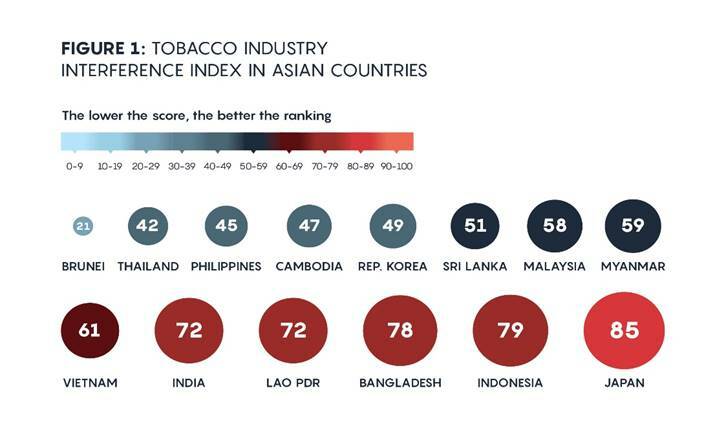 This is the main finding of SEATCA’s Asian Tobacco Industry (TI) Interference Index. Leading countries & slow countries: Brunei, Thailand and Philippines are doing well in implementing Article 5.3 consistently and creating awareness among other government departments on industry interference. However, there is room for improvement. Japan, Indonesia and Bangladesh are lagging far behind other countries in most issues in implementation of Article 5.3. Thailand is the first country in Asia to require tobacco companies to submit a full report about their business including expenses on marketing, volume of production or importation, market share, income and expense for the benefit of tobacco control. Vietnam is the first Asian country to announce its non-engagement with the PMI-funded Foundation for a Smoke-Free World (FSFW) in line with WHO recommendations. So-called CSR activities: The tobacco industry continues to use the tobacco-related CSR channel to access senior non-health government officials. Even when a government prohibits officials from participating or endorsing CSR activities, as in the Philippines, the industry uses other business charities to access senior officials. Lack of transparency: Non-disclosure of interactions with the TI remains a problem across most countries. For example, when officials meet with the TI, records of these meetings are not made public. Countries also do not have a register of TI entities, their affiliate organisations, and individuals acting on their behalf. Benefits to the tobacco industry: Several countries provide benefits to the tobacco industry such as duty exemptions, subsidies, or locating factories in export processing zones. Benefits also include extending compliance deadlines of policy measures such as implementation of pictorial health warnings on packs. Unnecessary interactions: Unnecessary interactions occur either through government officials attending events organised by the TI or engagement in industry-initiated anti-smuggling programmes, which makes officials vulnerable to TI influence in policy development. Conflicts of interest: Conflicts of interest arise when former senior officials are appointed in the TI or industry executives become advisors to the government. Most of the countries do not prohibit political contributions from the tobacco industry to politicians or political parties, nor require full disclosure of such contributions. Governments must dramatically step-up their efforts to implement Article 5.3. Transparency is key and is much needed in dealing with the tobacco industry. This is an area that needs major improvement across all countries. Governments need to record all meetings with the tobacco industry and their outcomes. The TI is not a stakeholder in public health. Procedures need to be put in place to restrict tobacco industry participation in policy development in every country. Countries need to protect the civil service and adopt a Code of Conduct for all government officials, as the Philippines has done. The TI uses CSR activities to gain favour with policy makers. Governments should ban CSR activities by the TI, as Thailand has done.